In its first episode, The Opposition With Jordan Klepper must lay out its comic strategy with haste. 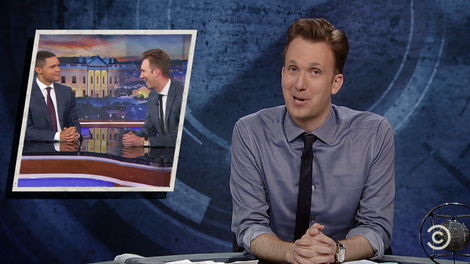 Klepper, in his role as “Jordan Klepper”—a beady-eyed, fast-patter conspiracy maven who confides that his time on the liberal-leaning Daily Show was just an elaborate mole operation uncovering the nefarious workings of the mainstream media (or a mockery thereof)—must not only set up the show’s premise and handle an in-character interview (with Spy magazine co-founder and author Kurt Anderson), but also conduct rapid-fire introductions of his six-person “citizen journalist” correspondent team. And since each of those correspondents are also in character as various simulacra of recognizable fringe media and talking-head types, this first episode serves, even more than usual in a pilot, as a dizzyingly brisk sampler of potentiality. The Opposition essentially (and promisingly) splinters the layered put-on Colbert formula among a handful of experienced improv performers. (The correspondents all come from either Upright Citizens Brigade or Second City backgrounds.) And the correspondents themselves all leap into their brief appearances here with an eye toward establishing themselves as recognizable types, if not one-to-one impressions. It’s a lot to take in, a kaleidoscope of kooks whose actors’ adeptness at adopting their individual personae will be tested in the shows to come, especially once they (one assumes) start doing in-character interviews with people who take their similarly extreme views very seriously indeed. As a template, Klepper’s interview with Anderson (author of the book Fantasyland: How America Went Haywire, A 500-Year History) showed that it can be done entertainingly—as long as Klepper (not “Klepper”) and his guest are, in reality, on more or less the same page. Klepper, whose lean, frat boy-predatory handsomeness (complete with high-and-tight ’do of the sort favored by similar-looking “alt-right” types) is ready-made for a career in ironic douchebaggery, and he’s quick and confident on his feet. Like “Colbert” before him, “Klepper” steamrolls over problematic statements from Anderson here on his way to snatching up the one, context-free concept he can claim as a victory for his side. When Anderson lays out his thesis about how the system of societal checks and balances that formerly mitigated the “passionate American craziness” he claims as an essential component of the national character has broken down in the age of Trump, Klepper leaps at the idea that the late-’60s timing of that erosion means that “it’s the hippies’ fault.” Basking in Anderson’s laughing “yes, but...” response, Klepper plows ahead before any complicating perspective can be applied. Looking back, The Opposition leans right into its two biggest challenges. If he’s yet another white guy joining the late-night comedy ranks, then he’s going to be the whitest guy in town, his slickly unhinged half-feigned cluelessness on issues of race, gender, and essentially everything else, the apotheosis—as was Colbert’s—of unearned confidence and white cis-male privilege. 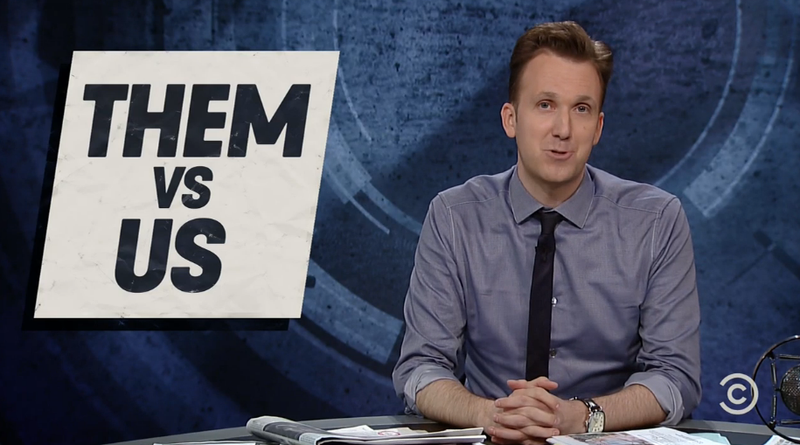 Cloaked in a protective veneer of victimhood and self-righteousness, “Jordan Klepper” presents himself as the one, true voice in a world of confusingly complex and frightening points of view that are seeking to batter down the citadel of his knee-jerk bigotry. Citing the “abundance of facts” coming at the average, hard-working (white) American, this Klepper asserts that, on his show, “you get to pick the facts that are right for you.” Colbert similarly and memorably started out the very first Colbert Report with the concept of “truthiness,” a comforting warping of reality used to reinforce one’s own beliefs. When Colbert left The Colbert Report and Comedy Central for cushier CBS pastures, he mostly retired “Stephen Colbert” as a character, and abandoned truthiness as a concept for someone like Klepper to pick up, and transform. And just as Colbert felt that his mock right-wing Fox News punditry had run its comic course, truthiness is in need of an update. The election of Donald Trump and the degeneration of respect for not only provable, empirical, often inconvenient facts but the very concept of truth itself proves that intellectual honesty as a condition of American social structures is in serious jeopardy. Science is in the way. News is fake. Facts that assail ingrained prejudices or placating illusions are brushed away with ad hominem attacks, denial, online harassment, and racist frog memes. For Klepper, the stakes—for his show and for public discourse—are exceptionally high, and fraught. For one thing, should The Opposition follow the Daily Show model of interviewing those on the intellectual and moral fringes of American society, there’s a danger that the correspondents of Klepper won’t have the chops to turn hate, ignorance, or outright lunacy into meaningful, illuminating comedy. There’s also the risk that, by pointing its cameras at the figures it’s satirizing, The Opposition will only serve to extend the reach of some truly reprehensible ideologies and individuals. In a half-hour premiere, The Opposition throws down the gauntlet boldly. It’s up to Klepper and company to take on what comes of that. A country with a white nationalist (at least) leader in the White House can use all the political satire it can get—as long as it’s good. The dilemma facing satirists and comedians in a world where Donald Trump is running the country is that every day is a new exercise in topping the un-reasoning insanity that has become appalling reality. The sort of sly approach that Klepper is attempting here is ambitious, risky, and, in this first outing, promising. In addition to an actual rant about the Clintons habitually practicing voodoo from InfoWars host Alex Jones, Klepper (or rather “Klepper”) plays a clip of a furious Jones rebutting everything he’s heard about how he’s going to be portrayed on The Opposition.